Dechala is the mistress of the Tormentors, the greatest of all of Slaanesh 's warbands to ever roam the Chaos Wastes. She is as cruel as she is beautiful and as pitiless as she is beguiling. The earliest records of the ravages of Dechala reach down through the centuries. Some say that she was blessed with great age by Slaanesh, or maybe the legends that she was once a High Elf princess are true. Dechala is mutated beyond recognition, making her a creature of Chaos more akin to a Daemon than a mortal. Her skin is smooth and milk-white. Her legs have been replaced by the lithe and sinuous body of a snake. Her multi-headed tail cracks like a whip, and drips with poison. Her multitudinous arms grasp heavy-bladed swords and her deep blue eyes glow with an inner light, promising terrible pain and pleasure to any who dare to stand before her. She has beauty that only Slaanesh may grant, but it is as unearthly and disturbing as it is irresistible. Her visage evokes loathing as much as it arouses pleasure. Dechala seeks the ultimate self-indulgence and freedom from the shackles of law and order, but she desires this pleasure only for herself: others can suffer and die as long as her wishes are fulfilled. She is served by a host of slaves, victims of her hideous poison that erodes both the will and the body. 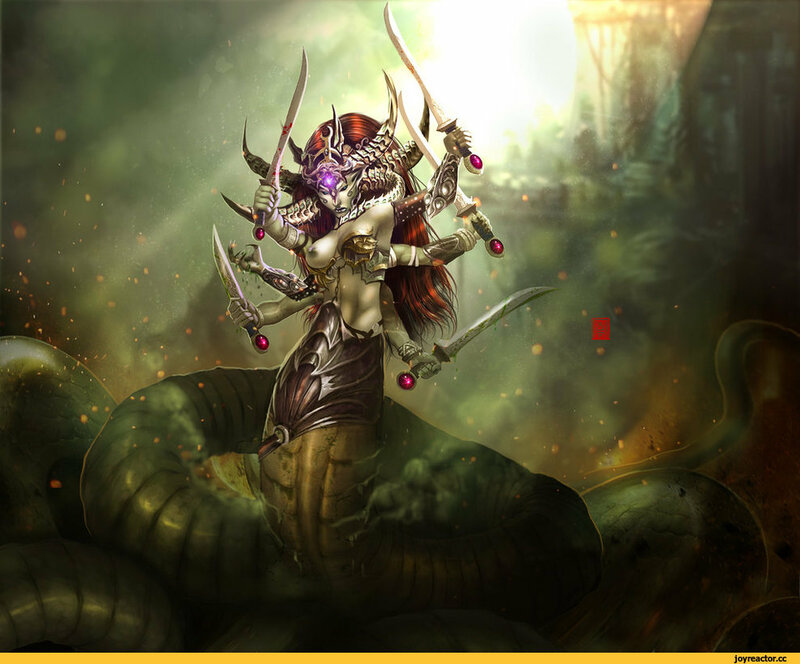 In battle Dechala is an enchanting sight, her snake-like body dancing to amuse her patron. And as delicate and as sensuous as her movements are, they are nonetheless lethal to those who dare to oppose her, and many an opponent has been cut to pieces while entranced by her dance. 9.2 из 10 на основе 222826 оценок.